One of the traditional methods for ‘cur­ing’ or, more correctly, masking rising damp is to dry-line an internal wall with plasterboard mounted on a batten frame – leaving a ventilated air space between the lining and the wall. This measure can be adopted for penetrating damp too, but it is expensive and it is much belter to cure the problem from outside – if possible. The limber battens used to hold the plasterboard must be treated with a wood preservative: and the wall and back of the board should be treated with a fungicide. It is generally advisable to use a vapour check grade of plasterboard. Many specialist companies will till cavity walls with an insulating material to cut down heat loss from your home. Nor­mally, these companies will not fill a wall which shows signs of penetrating damp. Any signs of rain penetration after filling should be reported to the company involved. Even though the cavity fill may itself not be the cause, it will often be necessary to disturb the material in order to diagnose the fault, after which any voids may need to be refilled. Most houses less than 10 years old are guaranteed against structural defects by the National House-Building Council. 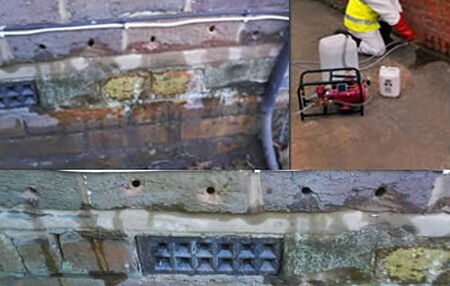 Contact the builder before taking any remedial measures against penetrating damp. If you are not satisfied with the result, approach the NHBC.